My oldest daughter finished trimming the tree with ornaments. I think it’s hilarious that she used to think I cut the tree, the fake tree of Christmases past. She didn’t realize that “trim” has other meanings aside from “cut.” Now that she knows, I suddenly seem much smarter. She and her friend broke a couple of ornaments. Both of them giggled when I exclaimed “Oh! Oh, well.” This drama-less decorating totally rocks the jingle bells. My son hung the stockings by the chimney with care. An eclectic arrangement of Christmas and every-day things. Seeing how he put it all together gives me insight into how his mind works. My youngest daughter draped the tree skirt around her shoulders before assuming the duty of Christmas Village arranger. She announced that she’s Elda from Frost, which she saw yesterday with her grandma. 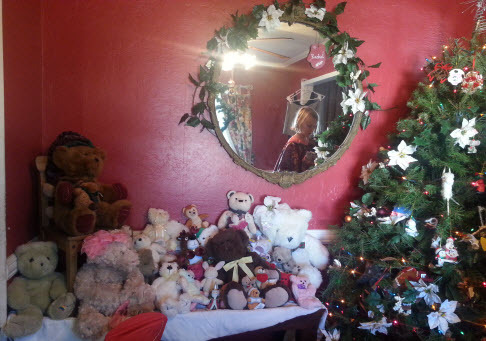 The teddy bear collection is mostly comprised of toys the kids once play with. A few are from my childhood, and a couple are ones that the kids or my husband gave me. They each have fantastic stories to tell, and we get to hear about their adventures each and every year. When we’re asleep, I think that the teddy bears have picnics. I can’t be certain, I’ve never caught them, but still, I suspect. Previous Previous post: Nutcrackers, sweet!